Lifting off from the Taiyuan Satellite Launch Center (TSLC) in China’s Shanxi Province, a Long March 4C rocket has delivered Fengyun 3D and Head-1 satellites into space. The launch was conducted from the LC9 Launch Complex at TSLC at 18:35 GMT (1:35 p.m. EST) on Tuesday, November 14. The mission was initially planned to by launched in 2016 but was rescheduled to late 2017 and the confirmation of the exact date of the liftoff came in late September. The Fengyun 3D satellite and the Long March 4C booster were delivered to TSLC in early June. 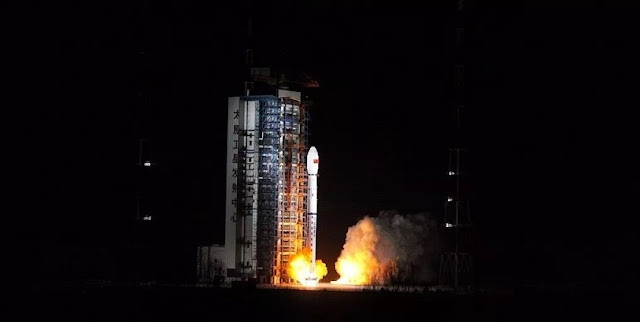 The mission was declared a success by the Chinese state-run Xinhua press agency when both satellites were delivered into a Sun-synchronous orbit (SSO). Debris from the rocket most likely fell somewhere in Hubei province in central China. Weighing about 2.3 metric tons, Fengyun 3D is a polar-orbiting meteorological satellite based on the FY-3 platform developed and built by Shanghai Academy of Spaceflight Technology (SAST). The satellite’s dimensions are 14.57 by 12.43 feet (4.44 by 3.79 meters) and it features also a deployable solar panel spanning about 33 feet (10 meters). Fengyun 3D is designed for ocean and ice monitoring purposes. It will also study atmospheric chemistry and space weather. In order to realize these goals, the satellite carries 12 instruments to capture multi-spectral imagery, collect atmospheric soundings, capture mircowave and infrared emissions, measure space radiation and collect ozone measurements. The spacecraft will operate in a near-circular SSO at an altitude of approximately 520 miles (836 kilometers), for up to five years. Fengyun (“Wind Cloud” in Chinese) is a meteorological satellite program managed by China’s National Satellite Meteorological Center. The project is designed to monitor the weather and climate of the Earth by capturing images of clouds and cloud systems. Fengyun 3 is the third phase of the project initiated in 1988. The first satellite in this series - Fengyun 3A - was launched into space in May 2008. Next Fengyun 3 satellite, Fengyun 3E, is scheduled to be launched into orbit in 2018. Second, much smaller payload of Tuesday’s mission is a maritime satellite named Head-1. Operated by a Beijing-based company Head Aerospace, the nearly 100-lbs. (45-kilogram) spacecraft is designed for ship tracking. Head-1 features the Automatic Identification System (AIS) payload system, which has good detection rate for the ship's high-density and medium density areas. Head Aerospace revealed that this system is capable of decoding two million messages from not less than 60,000 ships per day. Head-1 will reside in a SSO at an altitude of 502 miles (808 kilometers) for up to three years. During this time, Head Aerospace will use its AIS system to complete the coverage of global sea area and key river course, realize the position tracking, navigation and AIS data extension applications of global vessels. The satellite will provide its services to maritime, ports, shipping, fisheries, finance, insurance and government agencies in China and other coastal countries in Asia. Tuesday’s launch was the 21st flight of one of the nation’s Long March 4C launch vehicles. The flight also marked the 254th Long March launch overall and the 12th orbital mission conducted by China this year. Next Chinese launch is currently scheduled for November 21, when a Long March 6 booster carrying three Jilin-1 Earth-observing satellites will lift off from TSLC. 11/15/17 10pm earthquake update dutchsinse coppertropicals Nov 15, 2017~THANK YOU FOR BRANCHING MY VIEW OUT ALITTLE BIT.. U TUBE.>U HAVE A CHAIN U BREAK THE CHAIN WITH EVERY PLANETARY EXTINCTION ADD SOME NUKE WASTE>OH I WAS GOING TO SAY MIKE DARK MATTER COLLECTIONS IN CHICAGO>>>DEATH BY DESIGN!!! THE SILENT WAR WAGED ON EUMELANATED PEOPLE! !>HASSAN CAMPBELL Nov 15, 2017>FREE BOARD OF HEALTH IN INDIANA USED TO BE..BUT I AM TOLD U PAY PRICED ON AMOUNT OF TOXIN THE LESS TOXIC THE MORE MONEY AND THEY ARE NOT CHEAP 4=$$$$1100 MID RANGE.>>>WE ARE NOT HEARING A PEEP OUTTA U KOKOMO INDIANA BIG BUSINESS ARM OF MILITARY INDUSTRY COMPLEXS. SURE ARE>>NOT A THING OUTTA FORMER GOVENOR VICE PRESIDENT PENCE (MR. MUGG WOULD GET UPSET WHEN I MENTIONED FACTS IN THAT CLASS WHERE WE SUPPOSE TO BE HIGHER MINDED LOL KOKOMO 5 EPA SITE COULD BE MORE WATERS CROSS RITE)EPA WAS ON IT...THEY FORGOT IT...FOR SOME 35 YEARS LEAK DROP BY DROP TILLL A POISON PIT IN THAT WHOLE AQUAFER UNDER THE CITY BUT WE QUIET ABOUT THE FACTS~~THE CITY KNOWS I HEAR TH E LOCAL PAPER IS TALKING BUT NO NATIONAL COVERAGE THERE NOT EVEN THEIR BIG MONEY MAKERS TALKING WATER SAFFETY NO NNO TALKING>>>ACCELERATION RATE ^^^ SINCE MARCH 2011 WHALE..ELEPHANT STRUGGLING ALONG WITH BEAR CAT FROG FISHES U REALLY GETTING READY TO LOOSE MANY LINKS TO LIFE>U GOT THE METHANE SITUATIONALS. THANK YOU THAT WAS AN EDIT.